What was the Powhatan Confederacy? The Powhatan Confederacy was a cultural and political union of over 30 Algonquian speaking Native American tribes residing in Chesapeake Bay, Virginia, Southern Maryland. iT was a confederation of Native American Indians who provided military support and paid tributes to its powerful chief, Powhatan. The Powhatan Confederacy was a league of over 30 Algonquian speaking Native American tribes residing in Chesapeake Bay, Virginia, Southern Maryland. The tribes spoke the Algonquian language which was a family of North American Indian languages spoken by the Powhatan peoples. Discover interesting history, facts and information about the Confederacy and its founders. Also refer to the Powhatan Wars. The Powhatan Confederacy was named after the tribe which gave its name to the Powhatan confederacy. The powerful chief of the Powhatan tribe was called Wahunsonacock but he became commonly known as Powhatan after his tribe and the location of one of his favorite homes at the falls of the James River (aka the Powhatan River). Powhatan was a powerful warrior chief who had conquered, or assimilated, over 30 tribes in Virginia. Powhatan had inherited the leadership of a group of six tribes in the 1600's and expanded his authority to more than thirty tribes by 1607. Of the 30 tribes under his control all but the first six tribes were his own conquests. The conquered tribes tribes and their lands were absorbed into Powhatan territory and became part of the Confederation. When the Powhatan Confederacy reached its peak of power it covered a massive area of over 16,000 square miles with over 15,000 members. 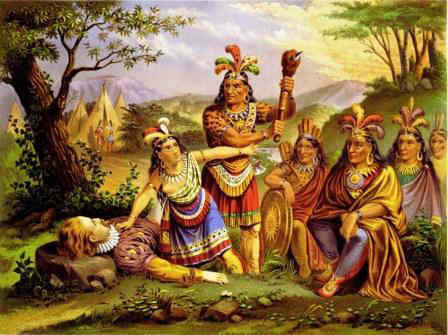 Powhatan was 60 years old when the first English colony was established in 1607, which puts his date of birth at c1547. It therefore seems probable that the Powhatan Confederacy was founded around 1580. Powhatan was so powerful and wealthy that the English colonists referred to him as a king. Powhatan had many wives and children but the most famous was his daughter Pocahontas (c. 1595 – March 1617) by his wife who belonged to the Pamunkey tribe. The Pamunkey were the largest and most powerful tribe in the Powhatan Confederacy. Pocahontas was born Matoaka c. 1595. In 1607 she is said to have saved the life of an Indian captive, the English man John Smith by placing her head upon his own when her father raised his war club to execute him (see the depiction in the above picture). In April 1614, she married tobacco planter John Rolfe and became known as Rebecca Rolfe with whom she visited England. To the English, she was known as "Queen of the Pamunkey". The Powhatan Confederacy were a group of Algonquian speaking tribes including Powhatan, Potomac, Chesapeake, Secacawoni, Chickahominy, Mattapony, Nandsemond, Weanoc, Pamunkey, and Mattapony. The tribes lived in palisaded villages, consisting of long dwellings called Longhouses (or Birch Bark Houses) which were permanent houses built by the Powhatan Confederacy tribes covered with bark or reed mats. The above picture, depicting Pocahontas and her father Powhatan, is historically inaccurate - tepees are featured in the background which were never used by the tribes of the Confederacy! The women of the tribes cultivated corn, beans, and squash; the men hunted and waged war, chiefly against the tribes of the Iroquois Confederacy. The villages were typically fortified, being surrounded by a strong palisade (fence) . The villages could have over 1000 inhabitants, some had a few hundred inhabitants but most villages were much smaller. The fall followed the series of Powhatan Wars between the Confederacy and the Colonists - see Colonial America. Their numbers decreased through warfare and the European diseases brought by the Europeans. Their Military defeats brought ruin and an end to Powhatan independence. In 1645 Chief Opechancanough was captured but he refused to admit defeat and sign a Peace treaty. He was shot in the back by an English guard whilst in captivity. With his death the Powhatan Confederacy came to an end.